The act of camping; rigging up some temporary form of shelter, or just sleeping out under the stars for recreation. For most people of the modern world it’s a daunting prospect – all that dirt, and the bugs! Good lord the bugs! Have you people ever heard of a hot shower? If your partner is anything like mine, you’d never catch them even considering the idea, at least that was, until recently. 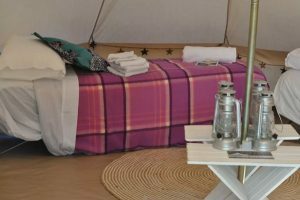 In the last few years the term ‘Glamping’ has arisen from the depths of popular culture. A joke to most outdoors types, but a legitimate passion for many; the term, as defined by Urban Dictionary, describes the act as ‘glamorous’ or ‘fake’ camping. If you’ve watched popular TV dramas you’ve probably seen an episode involving it; typically a very precious girlfriend joins her boyfriend and his friends for a camping trip and packs everything including the kitchen sink. 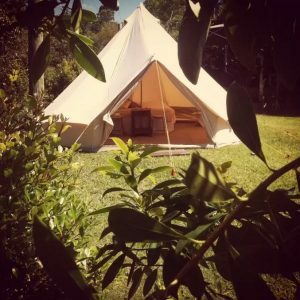 Without a doubt the Sunshine Coast has some of the best camping spots in Australia – from the Hinterland to the many beaches we love, there’s plenty of choice. The only problem is, how do we get our sceptical, or downright defiant partners to give it a go? Simple. 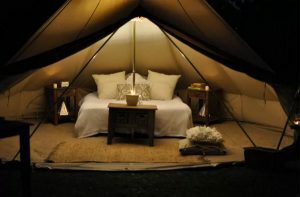 Glamp. Usually it’s a pretty expensive investment, especially since there isn’t a guaranteed result, but now there’s another option. They are a new group, aptly calling themselves ‘Pitch’ and they are offering the ‘Glamping’ experience without any effort. 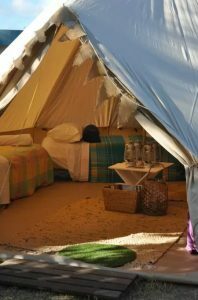 For a very reasonable fee they will come to your camping ground of choice and set up all the luxury you require. Originally designed as a couple BnB style getaway option, packages alter to accommodate groups from two to as many as sixteen people in incredible comfort, including: a fully furnished tent; hot shower, private toilet, chilled cooler, dining table and chairs, a fully equipped kitchenette, a relaxing lounge setting, linen and towels and the services of a chef and surf guide upon request. Recreational equipment such as surfboards and stand up paddleboards can all be waiting for your arrival to ensure you are making the most of the experience. 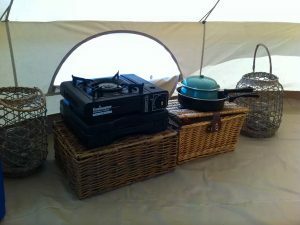 ‘We love the outdoors natural camping experience, but we also know how much work goes into it, being campers ourselves. We also love to ‘live it up’ a little with some luxury every now and then. So we have combined the two! Beach beauty and sleeping beauty – the best of both worlds!’ – Tim and Lisa, from ‘Pitch’. On Airbnb.com they’re an absolute hit, with loads of great comments and positive feedback complimenting them on their service and personalities as well, an awesome and unique experience here on the Sunshine Coast. 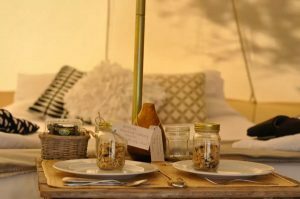 I’m going to start preparing to convince the misses to give it a go – if you want to as well, check out Pitch Luxury Camping posting here.